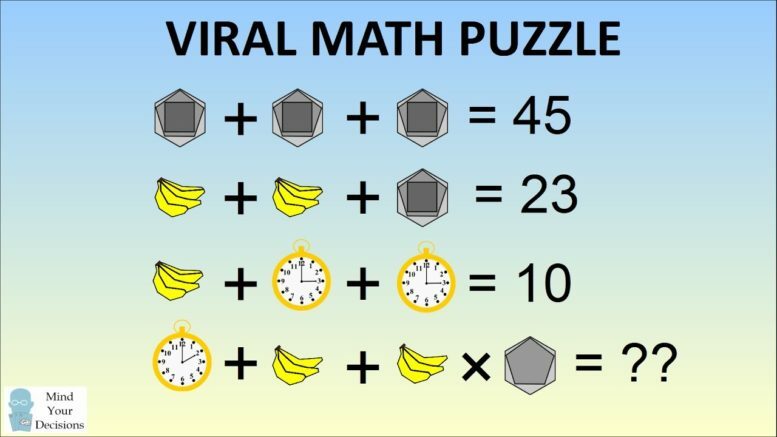 This Viral Math problem is being shared with claims that only geniuses can solve it and that 99 percent fail to find the correct answer. First, it is important to notice the shapes in the final line are different from the shapes in the previous lines. The clock shows 2 o’clock instead of 3 o’clock; there are 3 bananas in the bunch versus 4 bananas in a bunch; and the shape has 11 edges (it’s missing the square) compared to the shape with 15 edges.